Shango, just speak your words and I'll be free. Free from your coming, tasting me at night. Me smelling you smelling like somebody else. Curiously, this second part of Tarell Alvin McCraney's Brother/Sister trilogy is set in time before the first part, the magnificent opener The Brothers Size. The Young Vic knew that they had something special in the UK rights to The Brothers Size and have bagged the other two plays. Their production is jaw dropping. As when we enter the auditorium of the Young Vic, we realise that the playing area has been flooded so that the cast are up to their ankles in water. With the heat turned up to counteract the cooling effect of a large area of water, the steam of the Louisiana bayou is not far away. A giant propeller fan carved in wood spins above the auditorium. The reflections are sensational with the impression of sunlight playing on the water and in the middle of the pool there is an island housing a piano for the jazz musician. The lighting effects create dazzling sunshine and the play's central character Oya (Ony Uhiara) moves beautifully in the light as she runs a race watched by a sporting college talent scout "the Man from State" (Paul Thornley). 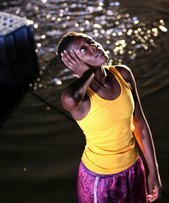 In the Red and Brown Water tells Oya's story — how she turns down the chance of a college athletic scholarship because she wants to look after her sick mother (Adjoa Andoh), falls for a man who leaves to become a soldier, Shango (Ashley Waters) but settles for Ogun Size (Javone Prince) because he is a good man. But the seductive lure of Shango is strong and Oya wants a child. We have a version of Oya's story told to us in The Brothers Size, that is Ogun's version as he explains to his brother Ochoosi why Oya is no longer living with him and the shocking incident between her and Shango when she hears than another girl has become pregnant by him. Because I had seen The Brothers Size the night before, Ogun's account was fresh in my mind but I found that his interpretation of Oya's motives was not the same as mine seeing this enacted. Again Tarell Alvin McCraney tells a story which is powerful and evocative, the desperation of a woman seemingly unable to bear a child when she is surrounded by the easy fecundity of those who are still children. It's like an older woman, I knew. Desperate for a baby and miscarrying, sheshared a hospital ward with those having their pregnancy terminated. Elegba (John MacMillan) is just 16 in this play and his criminal tendencies limited to stealing chocolate from the local store but his girl is having a baby. Again the imagery is there linking Elegba and the moon, "Legba sneaks off behind the moon like a cloud, gone but still there". Walter Meierjohann's production is rich in atmosphere and Miriam Buether's design is reflected in the water and lit by Jean Kalman. When Oya feels the attraction of the slicker, smoother Shango instead of the stammering Ogun, a trumpet plays soulfully. Shango's technique is to caress Oya's ear, something she finds irresistible. As Oya wishes for a baby, having given up her hope of a sports career, she sets her trainers off floating in the water like small boats and listens to the sound of a baby crying. In one small piece of direction we know that her hopes for a career on the athletic track have been replaced by a wish to have a child. The performances are outstanding. Ony Uhiara's beautiful Oya in her own tragedy, "sweet, sad Oya" McCraney calls her. John MacMillan's fun, quirky Elegba, Javone Prince reliable stuttering Ogun who is always secod bets to Ashley Walters' confident Shango. There are comedy interludes too with the busybody Aunt Elegua (Cecilia Noble) or tragedy with the death of Oya's loving mother Mama Moja. Shun (Camilla Beeput) and Nia (Sheri-An Davis) contrast with Oya as two superficial good time girls. I know not whether it is the Nigerian mythological background that gives Tarell Alvin McCraney's plays such effortless mystical depth, or his poetic writing or the wonderful productions but the three elements combined contribute to a moving theatrical experience which lingers. Interestingly the playwright gives his play the soubriquet "a fast and loose play" which I find deeply ironic.